Last Issues' WInner Was: PauL Brennan, athLone To be in with a chance of winning a Defence Forces goody bag and T-shirt: 1) Complete the 9x9 grid so that each column, each row, and each of the nine 3x3 boxes contains the digits from 1 to 9. 2) Fill in your details. 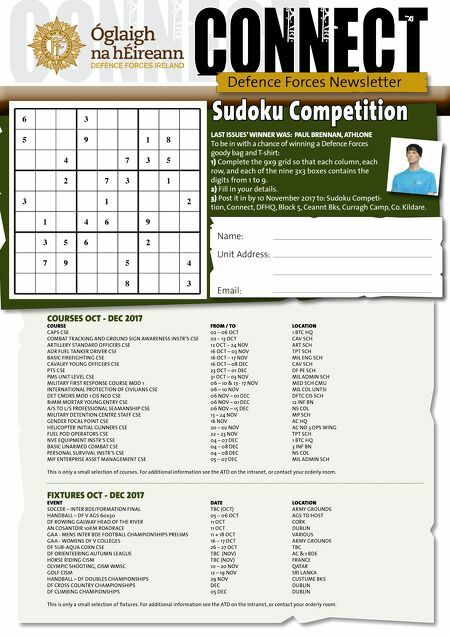 3) Post it in by 10 November 2017 to: Sudoku Competi- tion, Connect, DFHQ, Block 5, Ceannt Bks, Curragh Camp, Co. Kildare. Defence Forces Newsletter Name: Unit Address: Email: 6 3 5 9 1 8 4 7 3 5 2 7 3 1 3 1 2 1 4 6 9 3 5 6 2 7 9 5 4 8 3 Sudoku Competition COURSES OCT - DEC 2017 COURSE FROM / TO LOCATION CAPS CSE 02 – 06 OCT 1 BTC HQ COMBAT TRACKING AND GROUND SIGN AWARENESS INSTR'S CSE 02 – 13 OCT CAV SCH ARTILLERY STANDARD OFFICERS CSE 12 OCT – 24 NOV ART SCH ADR FUEL TANKER DRIVER CSE 16 OCT – 03 NOV TPT SCH BASIC FIREFIGHTING CSE 16 OCT – 17 NOV MIL ENG SCH CAVALRY YOUNG OFFICERS CSE 16 OCT – 08 DEC CAV SCH PTS CSE 23 OCT – 01 DEC DF PE SCH PMS UNIT LEVEL CSE 31 OCT – 03 NOV MIL ADMIN SCH MILITARY FIRST RESPONSE COURSE MOD 1 06 – 10 & 13 - 17 NOV MED SCH CMU INTERNATIONAL PROTECTION OF CIVILIANS CSE 06 – 10 NOV MIL COL UNTSI DET CMDRS MOD 1 CIS NCO CSE 06 NOV – 01 DEC DFTC CIS SCH 81MM MORTAR YOUNG ENTRY CSE 06 NOV – 01 DEC 12 INF BN A/S TO L/S PROFESSIONAL SEAMANSHIP CSE 06 NOV – 15 DEC NS COL MILITARY DETENTION CENTRE STAFF CSE 13 – 24 NOV MP SCH GENDER FOCAL POINT CSE 16 NOV AC HQ HELICOPTER INITIAL GUNNERS CSE 20 – 02 NOV AC NO 3 OPS WING FUEL POD OPERATORS CSE 22 – 23 NOV TPT SCH NVE EQUIPMENT INSTR'S CSE 04 – 07 DEC 1 BTC HQ BASIC UNARMED COMBAT CSE 04 – 08 DEC 3 INF BN PERSONAL SURVIVAL INSTR'S CSE 04 – 08 DEC NS COL MIF ENTERPRISE ASSET MANAGEMENT CSE 05 – 07 DEC MIL ADMIN SCH This is only a small selection of courses. For additional information see the ATD on the intranet, or contact your orderly room. FIXTURES OCT - DEC 2017 EVENT DATE LOCATION SOCCER – INTER BDE/FORMATION FINAL TBC (OCT) ARMY GROUNDS HANDBALL – DF V AGS 60x30 05 – 06 OCT AGS TO HOST DF ROWING GALWAY HEAD OF THE RIVER 11 OCT CORK AN COSANTÓIR 10KM ROADRACE 11 OCT DUBLIN GAA - MENS INTER BDE FOOTBALL CHAMPIONSHIPS PRELIMS 11 + 18 OCT VARIOUS GAA - WOMENS DF V COLLEGES 16 – 17 OCT ARMY GROUNDS DF SUB-AQUA COXN CSE 26 – 27 OCT TBC DF ORIENTEERING AUTUMN LEAGUE TBC (NOV) AC & 1 BDE HORSE RIDING CISM TBC (NOV) FRANCE OLYMPIC SHOOTING, CISM WMSC 10 – 20 NOV QATAR GOLF CISM 12 – 19 NOV SRI LANKA HANDBALL – DF DOUBLES CHAMPIONSHIPS 29 NOV CUSTUME BKS DF CROSS COUNTRY CHAMPIONSHIPS DEC DUBLIN DF CLIMBING CHAMPIONSHIPS 05 DEC DUBLIN This is only a small selection of fixtures. For additional information see the ATD on the intranet, or contact your orderly room.